Do you know this girl? In 1960, American documentary photographer Bruce Davidson was traveling in London, and captured this haunting image of a young woman holding a small kitten. Although 50 years have passed, the subject of the impromptu shot has held his curiosity ever since. Recently, Davidson was in the UK to accept an award, and spoke to The Guardian about the genesis of the photograph. He says: "She was with two friends and they were on their way to a concert which, as I remember it, took place on an island. I hung around them for a few hours. 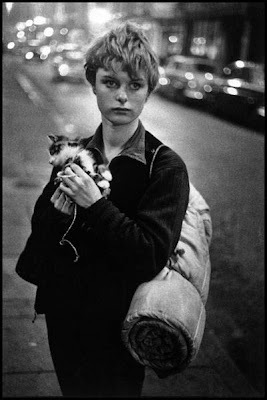 The girl with the kitten, the bedroll and the beautifully innocent, hopeful, mysterious face has stayed with me ever since." "If she is still alive, I'd love to know what she is doing now, what her story is. I never even wrote down her first name. I know it's 50 odd years ago, but someone out there must know who she is, surely." I remember that photo! Hope she turns up :). Wonder what happened to the kitty too? I have this as a London Time Out Poster from a couple of years back - framed and hanging in my hallway - I love it. Great picture and so cool of him to try to find her and find out her story. I sure hope they can find out who that is. That would be fun to do. It sure is a cute kitten. Good luck.